Mumbai/New Delhi: India’s largest software services firm, Tata Consultancy Services Ltd (TCS), grew its net profit to Rs1,252 crore in the second quarter this fiscal year, a 22.8% rise from the same period a year ago, as it used a higher billing rate, enhanced productivity and financial income to combat the effects of an appreciating rupee. The profit growth was the slowest in seven quarters as a strengthening rupee, the strongest Asian currency in the last two quarters, eroded income from the US, which is TCS’ biggest market. Shares of TCS rose 1% to Rs1,073.65 on Monday ahead of the results announcement on a day the broader market measured by the Bombay Stock Exchange’s 30-share sensitive index expanded 3.47% to a new record. This helped offset an increase in wages that impacted Ebitda by 1.17 percentage points and a 30 basis-points dent on account of a stronger rupee, which appreciated 2.19% in the quarter. “We had 24.95% as the operating margin last year; we are confident of achieving this again by the end of this financial (year)," said S. Mahalingam, chief financial officer, TCS. The firm defines operating profit as Ebitda plus gains from hedging. At the end of the September quarter, TCS had hedges worth $2.6 billion (Rs10,348 crore then), of which $1.1 billion is for the current quarter to 31 December. “By the end of this year (2007), we are expecting the rupee to be at 39.25 (against the US currency)," said Mahalingam. TCS said it had a marginal impact of the US subprime crisis on just one account. In the September quarter, revenues from customers in the banking, financial services and insurance (BFSI) industry grew by 8.9% in sequential terms, higher than the firm’s overall 8.4% growth over the preceding quarter. Such customers contributed 43.3% of total revenues in the quarter gone by. “We are confident of our growth in BFSI segment, but we will watch it very carefully," said N. Chandrasekaran, chief operating officer, TCS. Telecom, manufacturing, and transportation were the other industries that TCS reported a faster growth of business in, compared with the company’s average growth. 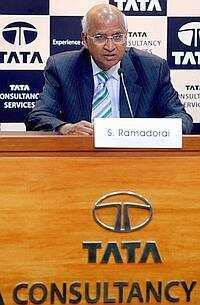 TCS announced progress in diversifying its portfolio of services and regional spread of its customers. Of the 51 new customers it added in the September quarter, more than 30 were from outside the US. The company achieving a 50% share of revenues from consulting, tech infrastructure management and back-office services was lauded by one analyst as evidence of a switch to more value-added services. “The numbers may not appear very buoyant to some, but they are reasonable especially if you look at 4% quarter-on-quarter growth on back of stable attrition (11.5%)," said Rishi Maheshwari, an analyst at Networth Stock Broking Ltd. “What will become more significant...is the company’s share of revenues from non-ADM projects." ADM refers to software application, development and maintenance, a relatively less profitable business compared with consulting and product implementation. TCS, which has had a 5% pricing increase on new client contracts and a 3-5% rise in billing of existing clients coming up for renewal, is pursuing 20 deals worth more than $50 million each. Chitra Somayaji of Bloomberg contributed to this story.